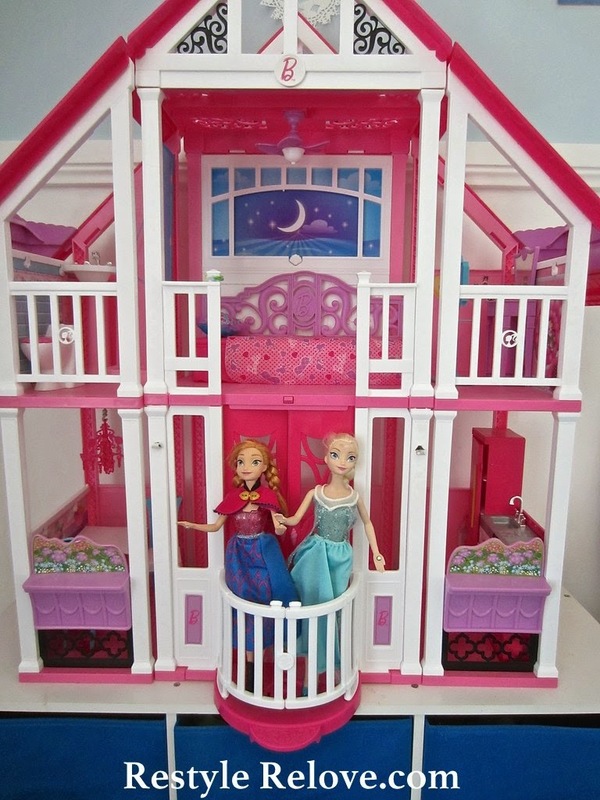 Like almost every other 6 year old girl at the moment, my daughter is in love with the movie "Frozen". We saw it twice at the movies, and she watches it sometimes twice a day at home. The whole family is constantly singing the songs or saying quotes from the movie. 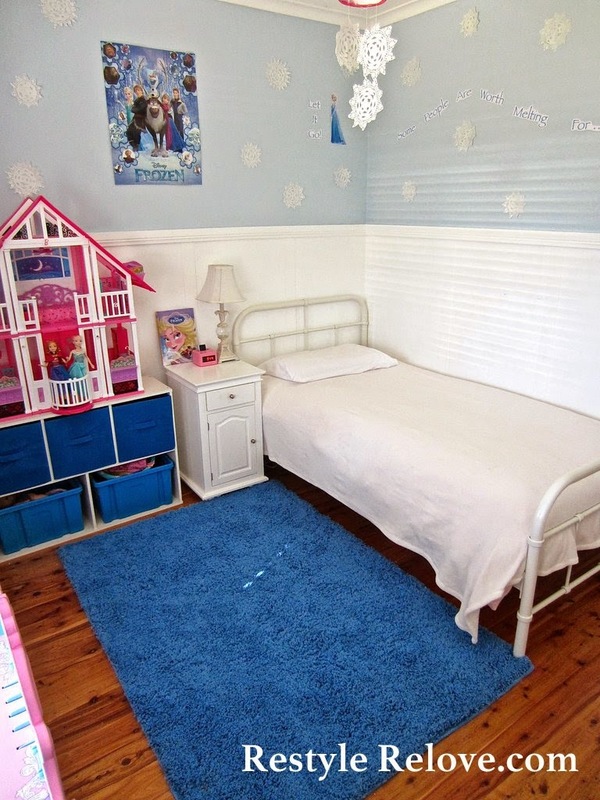 So when she mentioned she would love a Frozen themed bedroom, I was up for the challenge. 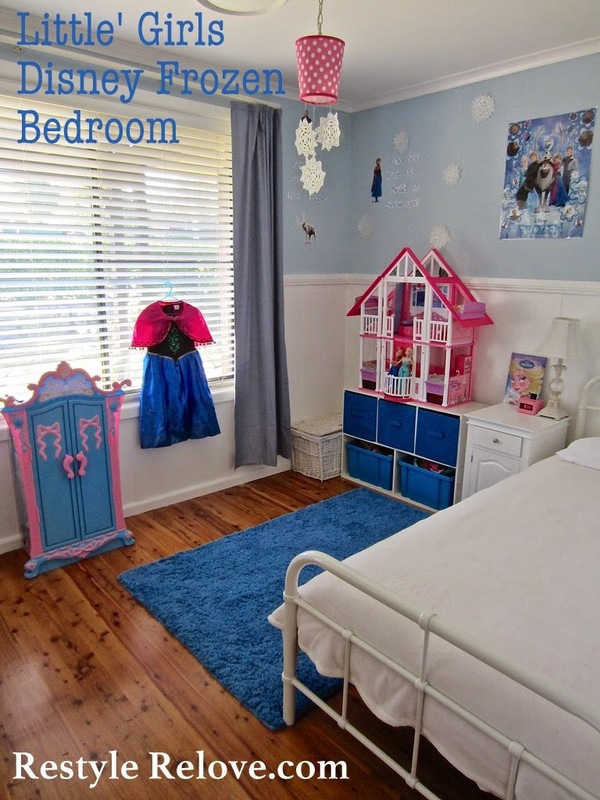 Here is what her room looked like when I did her last makeover a year ago. Since then we had replaced the curtains with her old tan ones and I had bought her a new white farmhouse style metal bed. 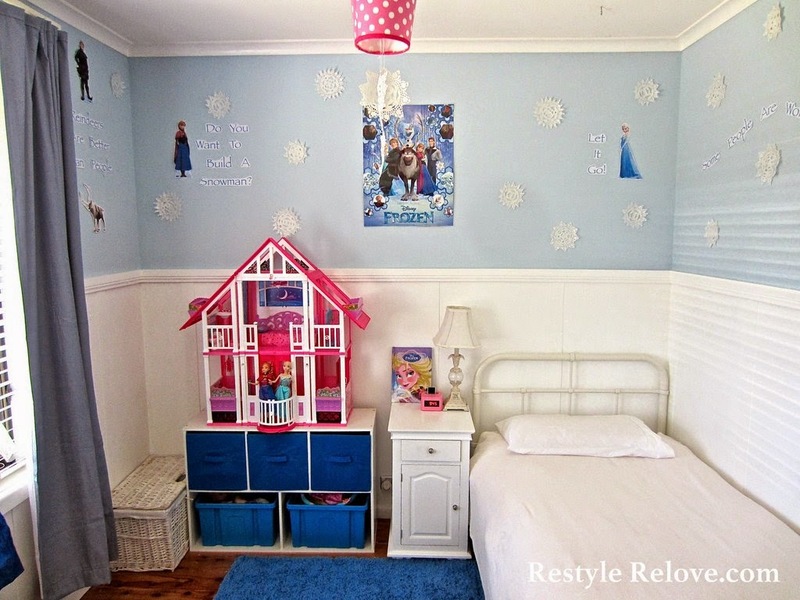 Her walls were pink as above, but we both agreed an icey blue would be perfect. I was lucky to have a tin of mis-tinted blue paint spare in my stash that I picked up cheap a while back. I just added some more white to lighten it up a bit and make it go a bit further. I got two coats on the walls in one day while she was at school. A while ago I sewed some blue block out curtains for the lounge room but they were taken down and packed away. We decided to use these in her room and took down the current tan coloured ones. The new blue ones matched perfectly. 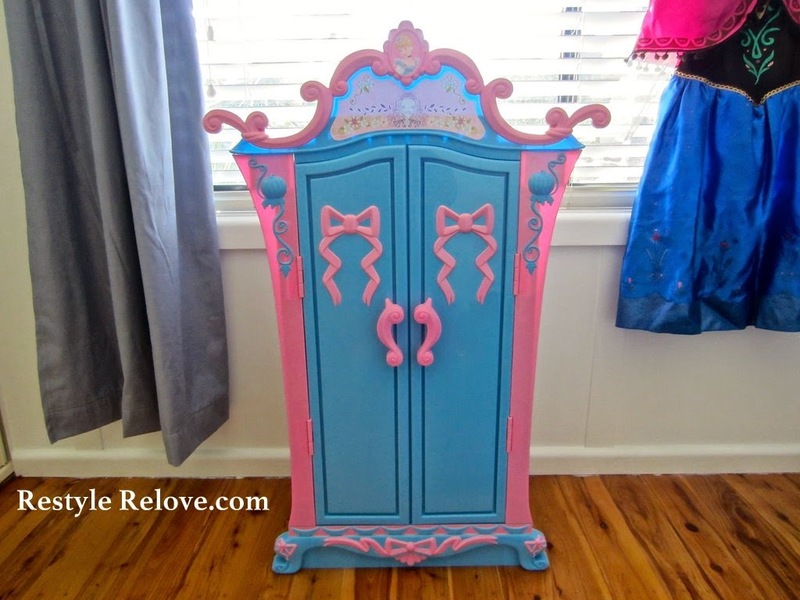 I found the cute Disney Princess Wardrobe at Target marked down to $15. Total score! 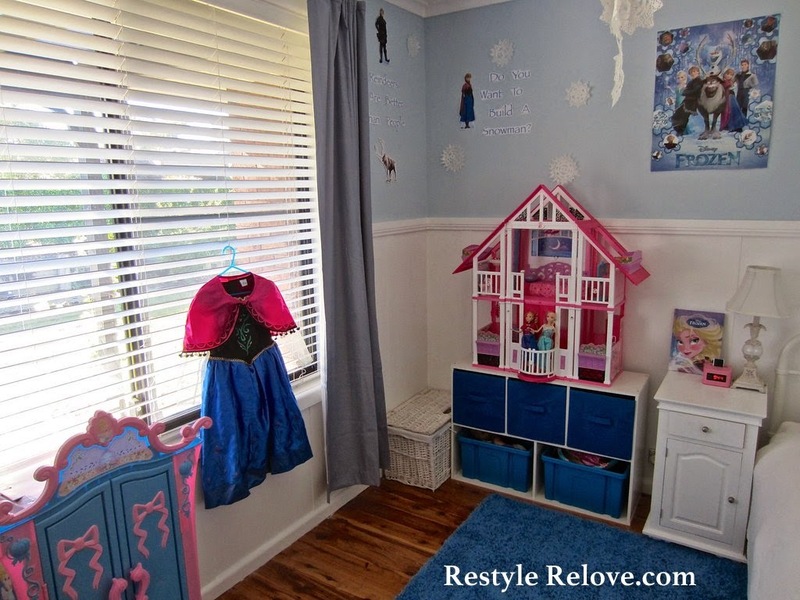 Perfect for hanging up her Elsa dress. 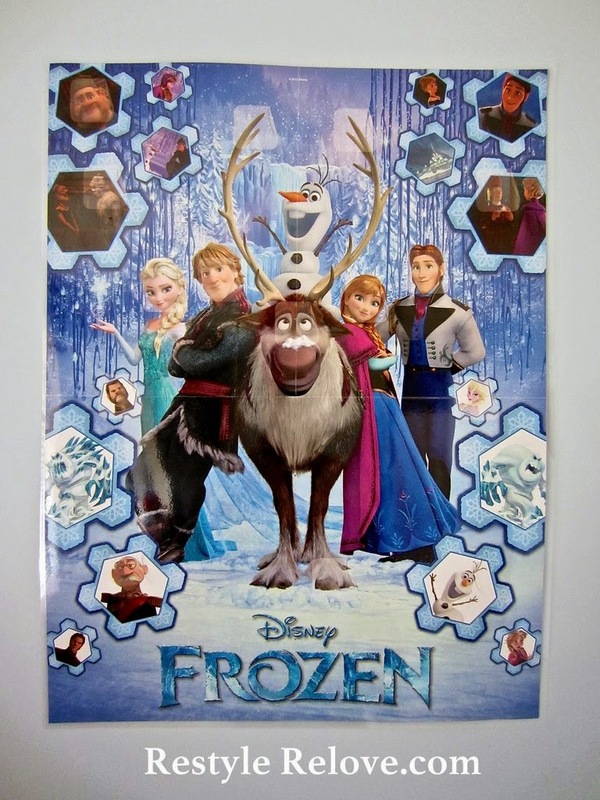 We found a magazine at the newsagents enclosing a movie poster which we got laminated to put on her wall. 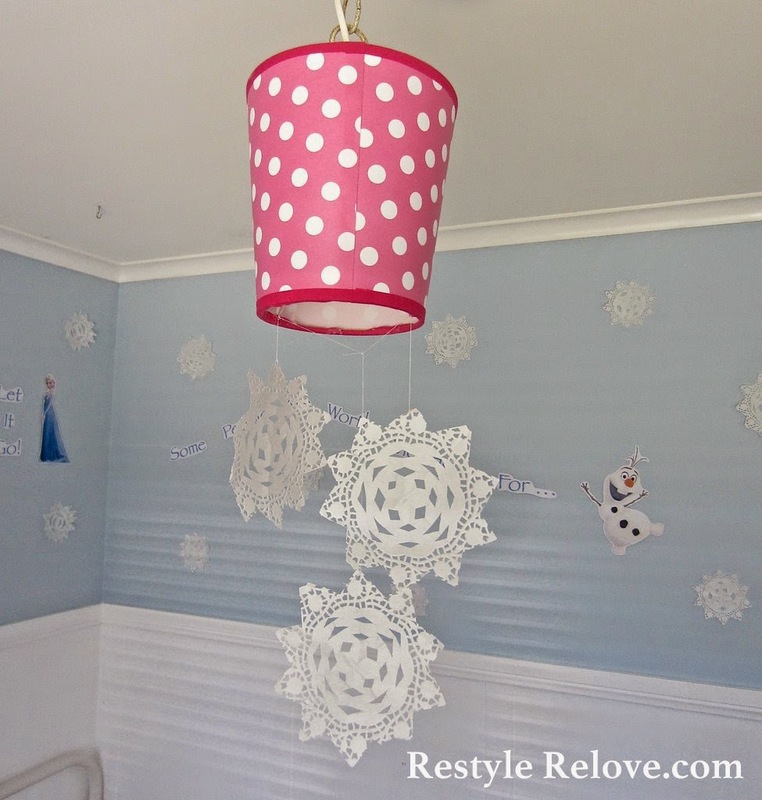 For decorations, I had two packets of white paper doilies on hand which I folded and cut into snow flakes. I simply used blu tac to attach them to the wall. I searched the web and found some cool character pictures which I printed out. 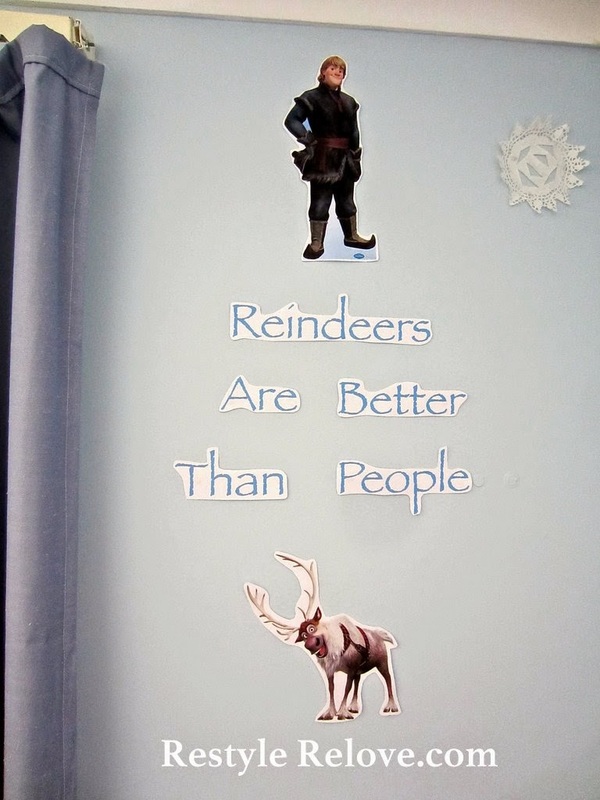 Then we decided on our favourite quotes and printed them out and added them to the characters on the wall, again with blu tac. 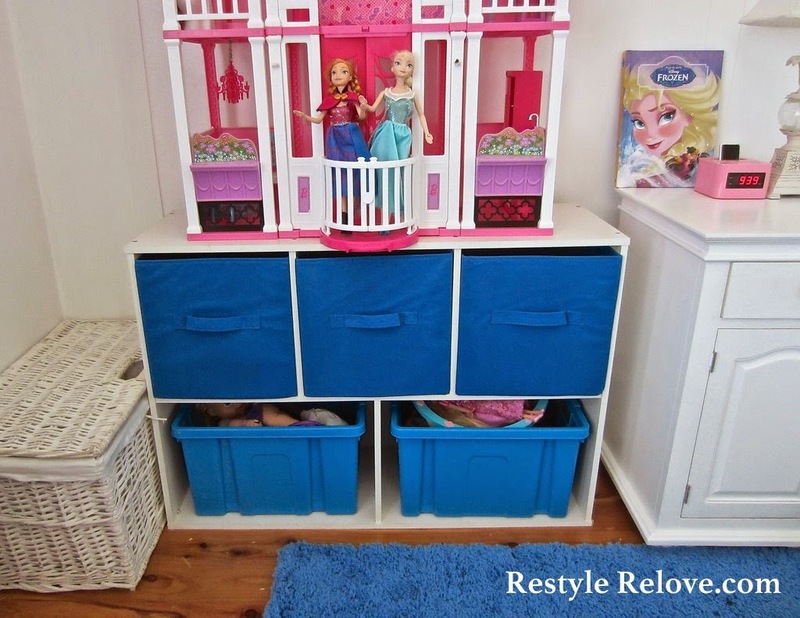 For toy storage, I replaced her red plastic buckets with blue fabric cube bins and 2 blue plastic bins. 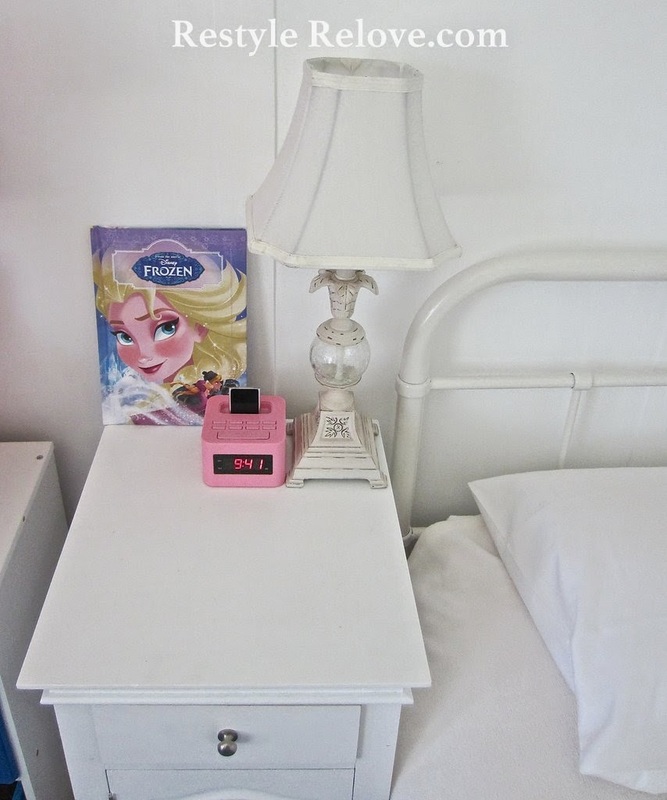 For her bedside light, I had a lamp which had a cute glass feature that blended in with the snowy theme. 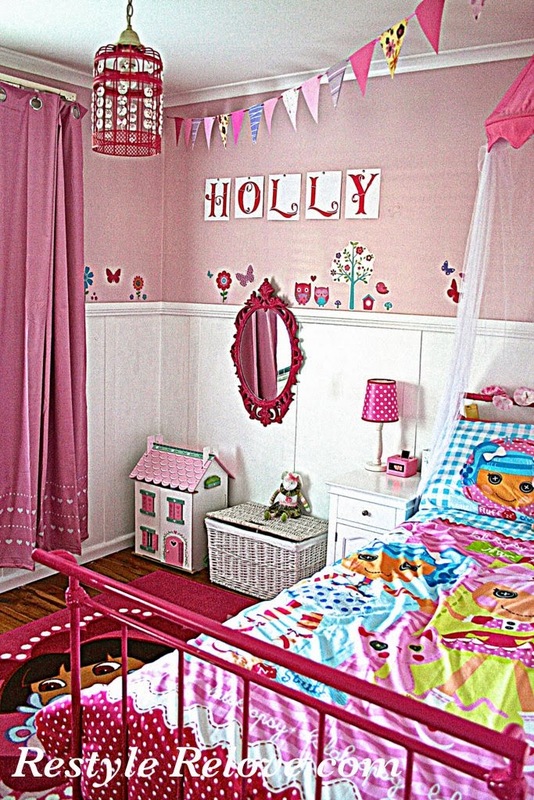 I took down her main birdcage style light shade and replaced it with her old pink shade that was next to her bed. 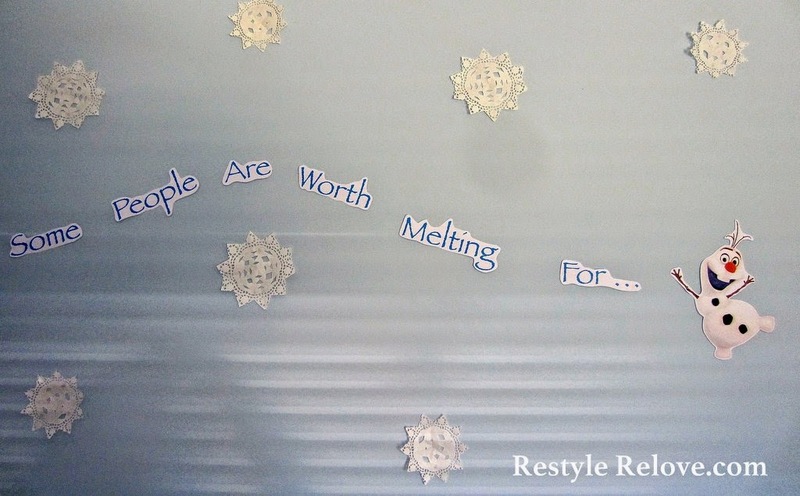 Then I added a few more snow flakes. 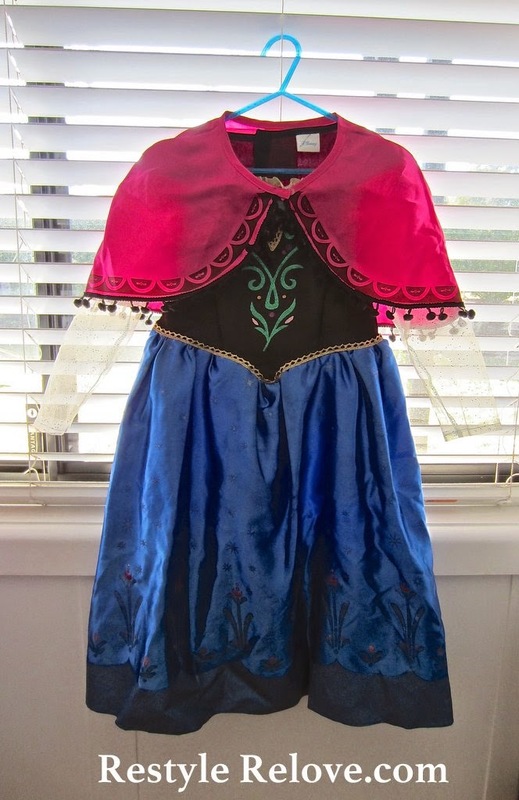 The pink is similar to Ana's cape so works perfectly and breaks up some of the blue. I decided not to change her bedding as her sheets are already all white and her pale pink polkadot quilt cover is quite new. She has a plush white blanket which I usually fold at the end of her bed, but now that it is winter it can be made up with the rest of the bed to look like a perfect blanket of snow on the bed. Rug - $100 but not counted in make over. I love that I didn't buy anything theme based (except the movie poster), not that there is anything available in the shops anyway! 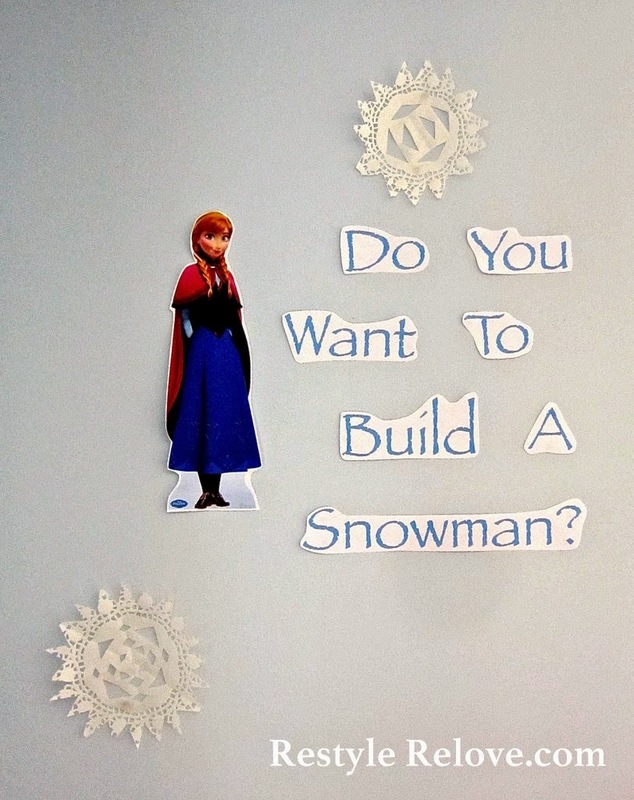 I was able to use lots of items I already had or made to create a beautiful Frozen themed wonderland that my daughter (and I) both love. So sweet ~ I'm sure she loves it! Wow Julie - how awesome! My Payton would fight your girl tooth and nail to sleep in that room lol. 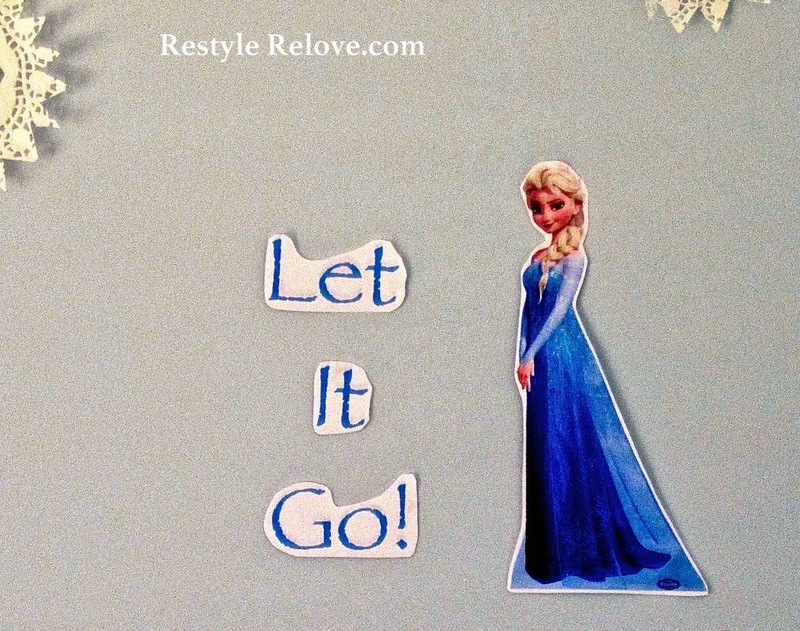 She is frozen obsessed! She wants so desperately to be Elsa but we tease her mercilessly that since she has freckles and is a redhead that she's Anna!! !